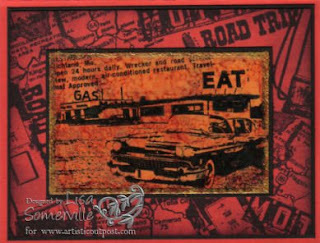 Artistic Outpost just released two new plates - Vintage Halloween and Route 66 . Here I've masked my images with eclipse tape so that the witch would be in front of the fence. I used my Sprial Punch from SU to create the look of a film negative. Images were stamped in Archival Black, then colored with markers. I used the cutter kit to distress the edges, then added some Old Paper Distress ink to the edges. On this card, I used the Metallic Stone Technique from the TJNL 6th Edition CD. 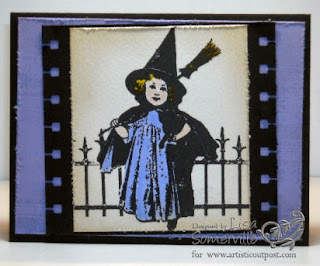 I stamped the images in black archival ink to create a collage on my base layer. Card Stock is SU's new Red Riding Hood Red, Black, and Glossy card stocks. For more information on Artistic Outpost's new releases and a Sneak Peek Special Promotion - click here! Lisa, I just wanted to tell you how much I enjoy your cards. You do beautiful work! So creative! I love that Halloween set! I think I have to have it!